Why is moss growing on my roof and how do I stop it? Have you gotten tired of seeing your roof camouflaged beneath a ton of moss? The nasty weed is all over your roof ruining the look and the quality roof? Well, in that case, you need to dig down the cause of this problem to find the right solution. Why does Moss Grow on Roof? If you have your house located in the partially shadded area, then this is the vicious cycle to your problem. That is to say, moss often grows in damp and shady conditions where there is almost no access to sunlight and the place is camouflaged under overhanging shadowy trees. To make matters worse; moss can cause a number of problems if it’s excessive growth is not prevented. It can block draining pipes, gutters and destroy the shingles ultimately causing permanent leakage. With that in mind, it is necessary to take some practical steps before the problem gets worse. You can implement the given ideas to deal with the moss problem and to guarantee the roof shingles don’t deteriorate with time. Many people consider power washers as one of the suitable options for getting rid of the moss. They certainly do the job for you, however; there are some potential issues with that. The perpetual use of power washers may damage the tiles on the roof. Plus, it can make the protective membrane of the roof fragile which ultimately causes your roofing material and loft to flood. 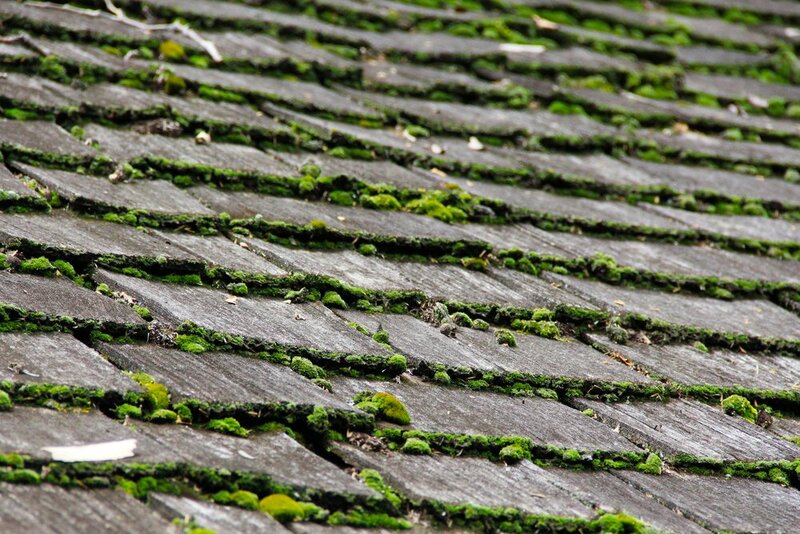 This remarkable and simple idea will definitely stop moss from accumulating on your roof. This can be applied right after you are done with your new roofing or have cleared the nasty plant. Zinc strips, according to roof experts can do wonders if applied along the roof’s apex. It has an alkaline effect when it reacts with water. After applying the strips, you just have to wait for rainfall. Rain along with zinc makes an inhospitable environment for moss to grow and prevents its growth in the future. Another convenient way to remove moss is using copper sulfate solution that is easily available at the hardware shops. The crystals in the solution need to be dissolved in the water and ¼ cup of dishwashing detergent. Mix the solution gently and pump it on the moss with the help of a spray. Ensure the entire roof is wet, not damp until the moss changes its color. Soon after applying you will notice the difference as it will rot and wither away.